EVERYONE WITH A JOB OR WITH AN EMPLOYEE - IT'S TIME TO PAY ATTENTION! Health care costs are reaching peak numbers in US history, and employers are the ones shouldering the burden. Are poor diet and not enough gym time causing these high numbers? They both certainly play a big factor, but studies are showing that a large part of this country's weight gain may in fact have more to do with our jobs. We went from a nation of farmers and manufacturers - people who worked with their hands - to a nation that is often found sitting behind a computer for the majority of the day. Even desk jobs have become more sedentary with the increased use of internet, email, and online chat tools. You never really need to leave your desk at all anymore. Besides the obesity issue, sitting alone can harm your body and well-being in several different ways. "Sitting is the worst thing you can do for your body," says Nuhar Jaleel, owner of The Pilates Principle in Latham, NY. "Our bodies are not made to sit. They are made to move." And sitting hunched up in front of a computer, on the phone, or at the steering wheel can cause aches, pains, and chronic disorders you might not even think about. This puts even more added pressure on businesses. Employers are realizing that it's time to pay more attention to the health of their workers and step up their efforts for health initiatives among their employees. Ross C. Brownson, an epidemiologist at Washington University in St. Louis says that as a society, "We need to think about physical activity as a more robust concept than just recreational physical activity. In many ways we've engineered physical activity out of our lives, so we've got to find ways to put it back into our lives, like taking walks during breaks or having opportunities for activity that are more routine to our daily lives, not just going to the health club." Employers are slowly starting to listen and are looking for ways to cut their employee health care costs. One study from the Omaha, NE-based Wellness Council of America reported that a company that contributed about $100-$150 per employee on wellness initiatives can actually generate about $300-$450 in return in reduced medical care costs. In other words, it's worth it. These are simple tools to add a few extra steps and some healthy messages, but still are not enough for today's sedentary lifestyles. 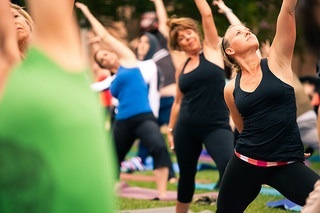 Many workplaces are adopting full wellness programs, offering incentives for their employees to participate and add some extra health back into their lives. Some companies offer competitions, no smoking incentives, and health screens. Others offer fitness programs right at the office, nutrition coaches, stress relief programs, ergonomic training, and instructional workshops on many topics. The key to finding a lasting and successful program for your work is to not fall in the trap of modeling a program after another company. Each business, and each employee population is different. Employers need to consider the set up of their building and the health needs of their employees, before deciding what kind of program will work for them. It's also important to show that management is behind this, supporting them, and willing to participate themselves. Initially, it may seem like a lot of work to set up a program, but in the long run, a successful program has proven to lower health care costs and make for happier, less stressed, and more productive employees. The New York State Public Employees Federation is one local business that decided to run a trial to see how implementing a wellness program in their office might work. They started with an after work exercise class right in the office building. The response was tremendous and they even had to start a waiting list due to space issues. "We were pleasantly surprised and overwhelmed by the number of people interested in this first session," says Nancy Holford, one of the coordinators. "It was an exciting beginning to the program." The participants were also excited by this new opportunity and are hoping that management will agree to continue the program. They were amazed not only at how much better they felt even after just the first class, but also by the great night's sleep each participant had that night, and by those that were pain-free from chronic conditions for the first time in years. Most of us cannot change what we do for jobs, or what we need our employees to do, but with a few simple life or organizational changes, we can change how these jobs affect us. A workplace wellness program is one simple measure that can benefit everyone involved!